Interested in adopting one of our American History titles? Let us know! Email us at textbooks@press.jhu.edu. See our requirements for desk and exam copies here. This updated edition of Ogbar's classic work contains a new preface that describes the book's genesis and links the Black Power movement to the Black Lives Matter movement. A thoroughly updated essay on sources contains a comprehensive review of Black Power–related scholarship. Ultimately, Black Power reveals a black freedom movement in which the ideals of desegregation through nonviolence and black nationalism marched side by side. Lehman demystifies the cowboy life by describing the origins of the cattle drive and the extensive planning, complicated logistics, great skill, and good luck essential to getting the cows to market. He reveals how drives figured into the larger story of postwar economic development and traces the complex effects the cattle business had on the environment. Grounded in primary sources, this absorbing book takes advantage of recent scholarship on labor, race, gender, and the environment. The lively narrative will appeal to students of Texas and western history as well as anyone interested in cowboy culture. The Coming of Democracy examines the evolution of presidential campaigning from 1824 to 1840. Addressing the roots of early republic cultural politics—from campaign biographies to songs, political cartoons, and public correspondence between candidates and voters—Cheathem asks the reader to consider why such informal political expressions increased so dramatically during the Jacksonian period. Drawing on period newspapers, diaries, memoirs, and public and private correspondence, The Coming of Democracy is the first book-length treatment to reveal how presidents and presidential candidates used both old and new forms of cultural politics to woo voters and win elections in the Jacksonian era. In The Webster-Hayne Debate, Christopher Childers focuses on the sharp dispute that engaged Webster and Hayne in January 1830. A concise, accessible account of the conflict and the related issues it addressed, The Webster-Hayne Debate captures an important moment in the early republic. Ideal for use in college classrooms or for readers interested in American history, this book examines a pivotal moment and a critical problem in the history of US politics. It also shows how Americans grappled with the issues of nationalism, sectionalism, and the meaning of union itself—issues that still resonate today. 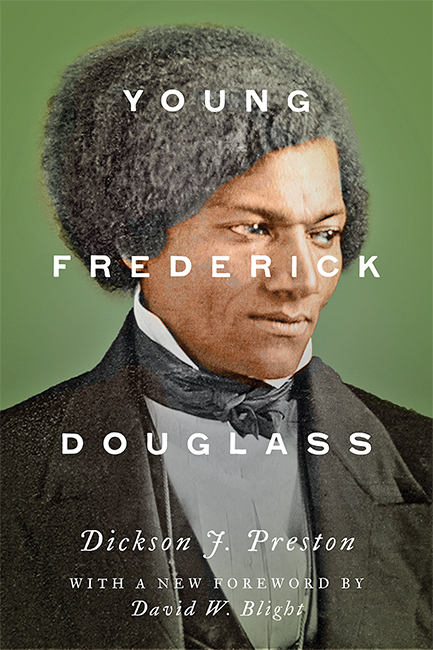 Drawing on previously untapped sources, Young Frederick Douglass recreates with fidelity and in convincing detail the background and early life of the man who was to become the undisputed spokesman for nineteenth-century black Americans. Astounding his white contemporaries with his oratorical brilliance and intellectual capabilities, Douglass dared to challenge the doctrine of white supremacy on its own grounds. At the time of Douglass’s death in 1895, one eulogist wrote that he was probably the best-known American throughout the world since Abraham Lincoln. In Charging Up San Juan Hill, John R. Van Atta recounts that fateful day in 1898. Describing the battle’s background and its ramifications for Roosevelt, both personal and political, Van Atta explains how Roosevelt’s wartime experience prompted him to champion American involvement in world affairs. Tracking Roosevelt’s rise to the presidency, the book argues that the global expansion of American influence—indeed, the building of an empire outward from a strengthened core of shared values at home—connected to the broader question of cultural sustainability as much as it did to the increasing of trade, political power, and military might. Drawing on newspapers, trade journals, and household advice books, Before the Refrigerator explains how Americans built a complex system to harvest, store, and transport ice to everyone who wanted it, even the very poor. Reviewing all the inventions that made the ice industry possible and the way they worked together to prevent ice from melting, Rees demonstrates how technological systems can operate without a central controlling force. Before the Refrigerator is ideal for history of technology classes, food studies classes, or anyone interested in what daily life in the United States was like between 1880 and 1930. According to Regal and Esposito, everything you think you know about the Jersey Devil is wrong. The real story of the Jersey Devil’s birth is far more interesting, complex, and important than most people—believers and skeptics alike—realize. Fascinating and lively, this book finds the origins of New Jersey’s favorite monster not in witchcraft or an unnatural liaison between woman and devil but in the bare-knuckled political fights and religious upheavals of colonial America. Providing a complete reappraisal of an old and popular legend, this book will entertain readers interested in colonial America, the history of New Jersey, or cryptozoology. Tracing a remarkable shift in scholarly interpretations of the Salem witch hunt from the post–World War II era up through the present, Fels notes that the dominant academic veiws encourage readers to sympathize with the perpetrators of the witch hunt, while showing indifference or even hostility toward the accused. Switching Sides aims broadly at an educated American public, for whom Fels provides sound knowledge about the Salem witch hunt—and leaves readers pondering the relationship between works of history and the ideological influences on the historians who write them. At a time when Americans are debating the future of public education, Johann N. Neem tells the inspiring story of how and why Americans built a robust public school system in the decades between the Revolution and the Civil War. By studying the origins of America’s public schools, Neem urges us to focus on the defining features of democratic education: promoting equality, nurturing human beings, preparing citizens, and fostering civic solidarity. David B. Danbom’s Born in the Country was the first—and still the only—general history of rural America. Ranging from pre-Columbian times to the enormous changes of the twentieth century, the book masterfully integrates agricultural, technological, and economic themes with new questions about the American experience. In a new and provocative concluding chapter, Danbom reflects on increasing consumer disenchantment with and resistance to modern agriculture as well as the transformation of rural America into a place where farmers are a shrinking minority. In John Quincy Adams and the Gag Rule, 1835–1850, Peter Charles Hoffer transports readers to Washington, DC, in the period before the Civil War to contextualize the heated debates surrounding the gag rule. A lively narrative intended for history classrooms and anyone interested in abolitionism, slavery, Congress, and the coming of the Civil War, John Quincy Adams and the Gag Rule, 1835–1850, vividly portrays the importance of the political machinations and debates that colored the age.